The more than 320 million Americans alive today depend on plants for our food, clothing, shelter, medicine, and other critical resources. Plants are vital in today's world just as they were in the lives of the founders of this great nation. Modern agriculture is the cornerstone of human survival and has played extremely important roles in economics, power dynamics, land use, and cultures worldwide. Interpreting the story of agriculture and showcasing its techniques and the crops upon which human life is sustained are critical aspects of teaching people about the usefulness of plants to the wellbeing of humankind. Botanical gardens are ideally situated to bring the fascinating story of American agriculture to the public -- a critical need given the lack of exposure to agricultural environments for most Americans today and the great challenges that lie ahead in successfully feeding our growing populations. 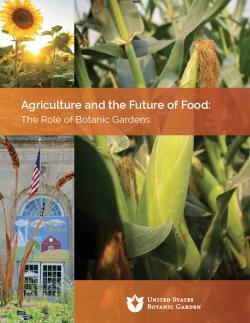 Based on a meeting of the nation's leading agricultural and botanical educators organized by the U.S. Botanic Garden, American Society of Agronomy, Crop Science Society of America, and Soil Science Society of America, this document lays out a series of educational narratives that could be utilized by the U.S. Botanic Garden, and other institutions, to connect plants and people through presentation of the American agricultural experience.